There they were. 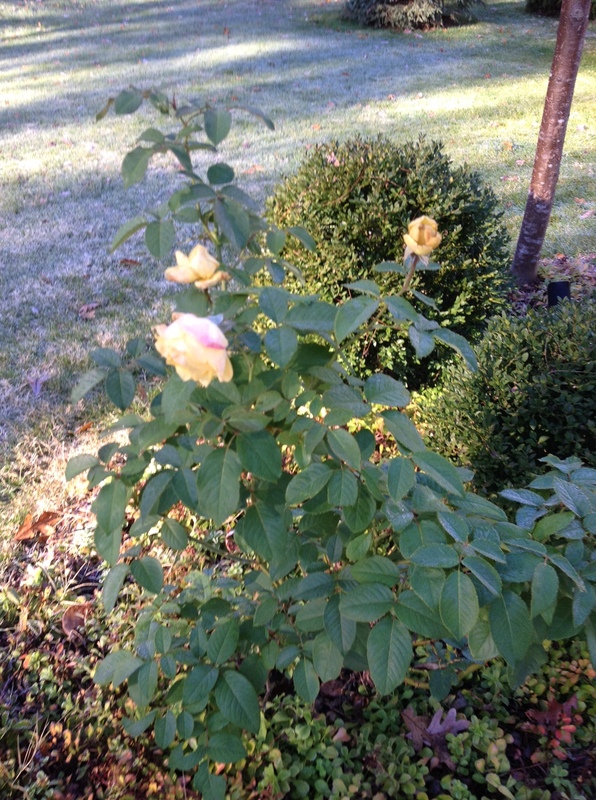 Three yellow roses blooming high on top of a frosted bush. The morning sunlight had just come over the horizon to take its own picture of them before I grabbed my camera phone to do the same. They are “My Mother’s Yellow Roses,” of course. All her life, the yellow rose was her favorite flower. Five years ago when I moved into this house I planted the yellow rose-bush as a way to keep me close to her. We lived far from each other, able to visit only once or twice a year. Yet, whenever I sat on my patio I felt close to her. The scent of yellow roses, their edges dipped in painted pink, brought us together. My glance at the rose petals always remind me of Mother. Particularly this morning. Perhaps it is the contrast of the glistening white frost that blankets the hill in the background. How it sparkles in the sun like fairy dust, covering the grasses and all of the green around it. The flowers I so prize in all colors and have withered. They hang, crumpled over rainbow pots. Their lives have ended for the year. It’s a sign of cooling weather. The changing seasons are upon us. Winter will be here soon. My mother is on my mind this month. She passed away three years ago in November of 2010. I was packing to board a flight to see her in Arizona. Packing three years ago on this day. It was not her time yet, but I knew….she would be lost to me, soon. She lived with several Chronic Conditions. The worst of which was, COPD which eventually triggered her lung cancer. Both conditions took their toll on her petite frame, making it hard for her to breathe. Nearly impossible at times. Indeed, in the end, it was. The yellow roses keep me close to my mother. Their blooms are hanging on as if to send a message to me this morning. In spite of the frost that snuffed life from all around them, they are still here to say, “Hello.” They have not withered or left their source of life. Today, they send me love from my mother above, and me right back to her. I predict the blooms of pale yellow may prevail for a few days longer. Like life for all of us on earth, no one but God knows when our steps may stop or end. Until the day of my own day shall come to pass, blue eyes of two peek out a window frame to view yellow roses. Lips below my nose begin to quiver, whispering a silent message to her above so full of yellow love. Posted on November 8, 2013 by kcg1974 •	This entry was posted in God, Grief, Love, Mother and tagged Children, Chronic Conditions, Family, Flowers, God, Grief, Heaven, Love, Mother, Nature, Parenting, Roses, Spirituality. Bookmark the permalink. You have my heartfelt sympathy! Thank you so very much. Nearing the anniversary day. Forever a difficult one. Blessings to you.